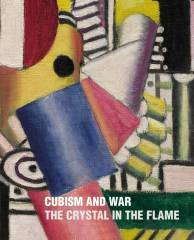 This book ––and the homonymous exhibition–– explores the work of artists who attempted to keep alive the expanded possibilities opened up for the arts of painting and sculpture by what was called Cubism in Paris between 1911 and 1914. This little community of artists refused to accept that recording the war or producing propaganda was their duty. They refused to forget the excitement of 1911-14, and kept faith in their independence as individuals as this war of machines threatened to rob every front-line soldier of his humanity and to draw even foreigners in France into “total war”. The vast majority of fit young Frenchmen were mobilized, so those artists left behind in Paris were either foreign or too old or unfit for combat. Pablo Picasso, then called the inventor of Cubism, remained a leading figure, alongside his fellow Spaniards Juan Gris and María Blanchard, the Mexican Diego Rivera, the Italian Gino Severini, and the Lithuanian sculptor Jacques Lipchitz. One feature of this book is the diversity of the work produced by these artists, each working as individuals. Another, however, especially from 1917, is the move made by most of them towards a more structured, architectural Cubism, which could be taken as reparative against the destructive forces that seemed to have taken over the whole world.>> Christopher Greenis Professor Emeritus of the History of Art at the Courtauld Institute of Art, London. Among his recent publications is Picasso: Architecture and Vertigo (New Haven and London, 2005). He has curated several exhibitions, including Juan Gris (WhitechapelArt Gallery, London, Staatsgalerie Stuttgart and Rijksmuseum Kröller-Müller, Otterlo, The Netherlands, 1992-93), and Henri Rousseau: Jungles in Paris (Tate Modern, London, Galeries nationales du Grand Palais, Paris and National Gallery, Washington D.C., 2006-07). >> Christopher Greenis Professor Emeritus of the History of Art at the Courtauld Institute of Art, London. Among his recent publications is Picasso: Architecture and Vertigo (New Haven and London, 2005). He has curated several exhibitions, including Juan Gris (WhitechapelArt Gallery, London, Staatsgalerie Stuttgart and Rijksmuseum Kröller-Müller, Otterlo, The Netherlands, 1992-93), and Henri Rousseau: Jungles in Paris (Tate Modern, London, Galeries nationales du Grand Palais, Paris and National Gallery, Washington D.C., 2006-07). >> Art historian, Dr Neil Cox is Head of Department of Art History and Theory at the University of Essex; author of the reference book Cubism, and co-author of A Picasso Bestiary. He has also written and presented two BBC TV series.